OXFORD, Miss. – Discarded machine parts, scrap metal, and other found objects serve as the inspiration for the University of Mississippi Museum‘s latest exhibit, “A Long Road Back,” by Texas-based sculptor George Tobolowsky. Tobolowsky’s metal sculptures will be on display inside and around the museum, as well as throughout Oxford and the Ole Miss campus, through Dec. 8. This series of steel and stainless steel sculptures ranges from abstract winding forms to representational subjects and elaborate menorahs. The incorporation of bold colors and found metal scraps create unexpected outcomes that pay tribute to the modern art movement. “I make abstract metal sculptures from steel and stainless steel ‘found objects,'” Tobolowsky said. “These found objects, however, are not of the everyday sort, but rather bulky industrial metal castoffs that I scour scrap yards and fabrication plants to find. A Dallas native, Tobolowsky received degrees in business and law with a minor in sculpture from Southern Methodist University in the 1970s and then focused on his corporate career for more than three decades. In the years following, he remained active in the local arts community but did not have his first solo exhibition until 2006 at the Gerald Peters Gallery in Dallas. His work immediately captured the attention of the art world, and he began shifting his focus to his art. Since then, Tobolowsky’s work has been displayed across the globe, including the International Exhibition of 12 Texas artists at the National Academy of Art in New Delhi, India, in 2015, the Jerusalem Biennale for Contemporary Jewish Art in 2017, and most recently at the Venice Biennale for Architecture and Sculpture in Italy in 2018. “The University of Mississippi Museum is highly honored to present this fall the work of internationally exhibited sculptor George Tobolowsky,” said Robert Saarnio, museum director. “Mr. Tobolowsky first exhibited in Oxford with a piece in the inaugural Yoknapatawpha Sculpture Trail installation in Pat Lamar Park. Besides the museum grounds and the Walton-Young house, Tobolowsky’s works can be seen around Oxford at Rowan Oak, The Graduate Hotel, The Inn at Ole Miss, Oxford Canteen, FNC’s offices on Office Park Drive, Baptist Memorial Hospital-North Mississippi, South Lamar Court and the Green Roof Lounge. Museum collections manager Melanie Antonelli and preparator Taylor Kite led efforts connected to the installation, exhibition design and layout. 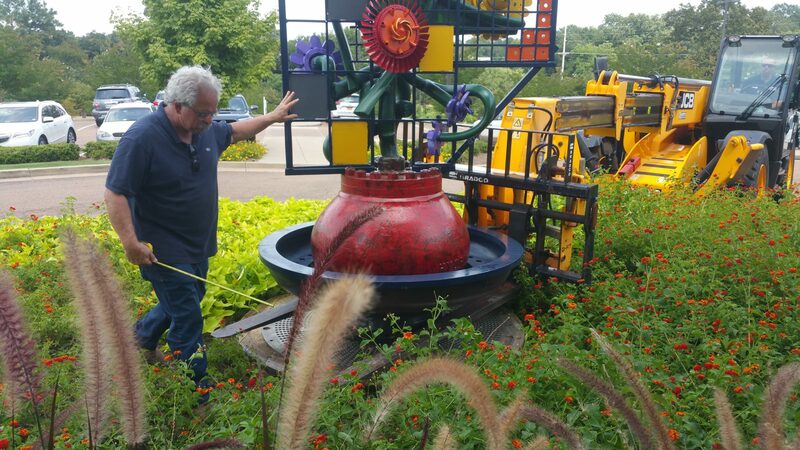 Sculptures sited around the city were installed with assistance from local artist Earl Dismuke. The UM Museum will host an opening reception at 6 p.m. Sept. 13 and an artist talk with Tobolowsky at 6 p.m. Nov. 8. The museum is open to the public from 10 a.m. to 6 p.m. Mondays through Saturdays. Admission is free. More information about the UM Museum and all its exhibits can be found at http://museum.olemiss.edu/.